My part made it to south Florida without any kind of a layover. To get it back to Georgia, however, required an extended stay in Orlando. Let's see if they get this right tomorrow. I've been waiting on a part I won off eBay for a little over a week now. It should have arrived yesterday. 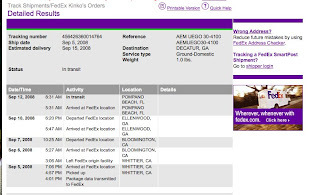 I've been watching the FedEx tracking for my part and things were going fine. The part made it from CA to GA just fine. Since I live in GA, this is a good thing. Then it went to FL!?!?! 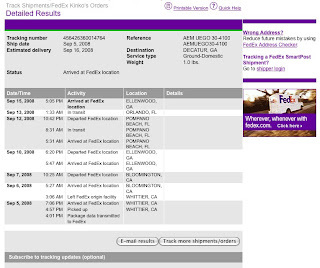 Looks like I get to wait a little more while FedEx fixes a cranial-rectal-inversion issue.